My mouth was saying let’s go while my mind was thinking, can I not go? 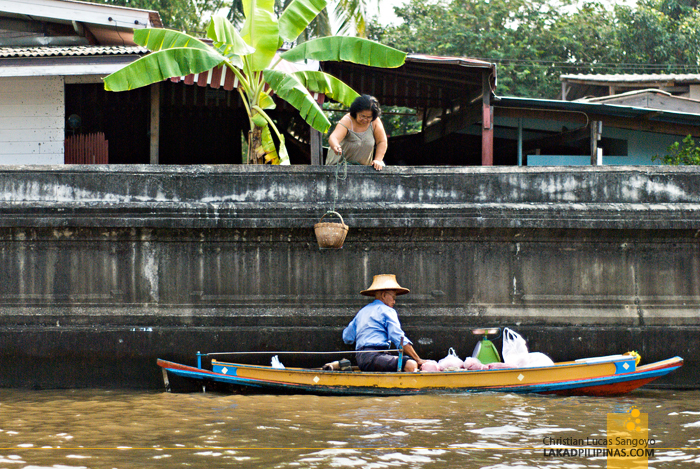 I gingerly walked towards the edge of the mildly swaying platform on one of the piers of the Chao Phraya River, handed over my camera bag to the boatman inside the long-tail boat—which was wildly bobbing up and down, by the way—and begged a prayer not to let my clumsiness take over and get dunked on the churning brown waters of the river below. Please don’t fall down. Please don’t fall down. Please. Don’t. Fall. Down. I don’t really hate boat rides. What I don’t like is the actual act of getting into one and equally, getting out of one. I can ride a bike but I really don’t balance well. Inching on a foot-wide plank from the safety of the still grounds to an even gently bobbing boat makes me ill. What more to a slim wooden boat, frantically swaying with no particular rhythm in mind. 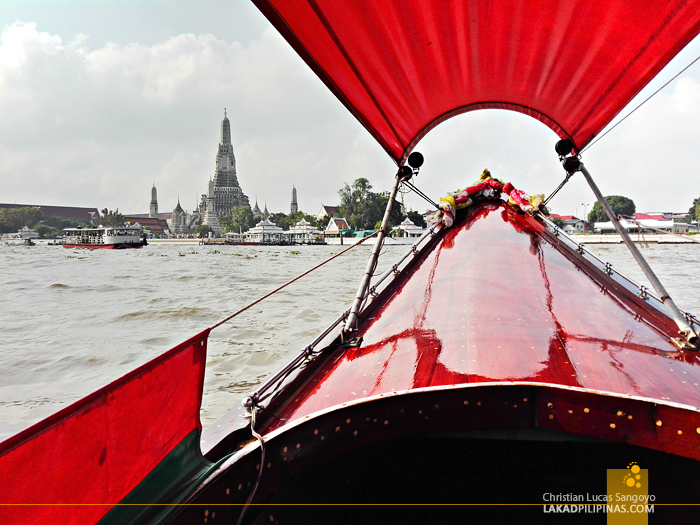 My will was being bent all through the points of the compass as I jumped off The Thien Pier and boarded the rua harng yao, Thailand’s traditional long-tail boats, for an hour-long sightseeing cruise along the country’s most famous river, the Chao Phraya. 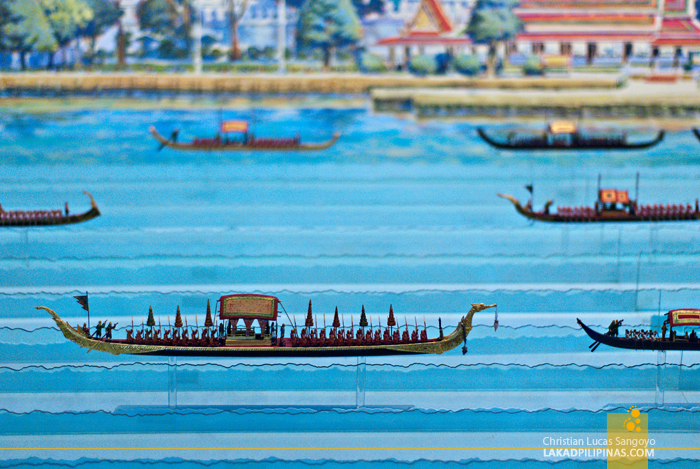 Its old name, Me Nam or Mother Water, and its current name, Chao Phraya or River of Kings, stems from the fact that it is the river of Thailand. 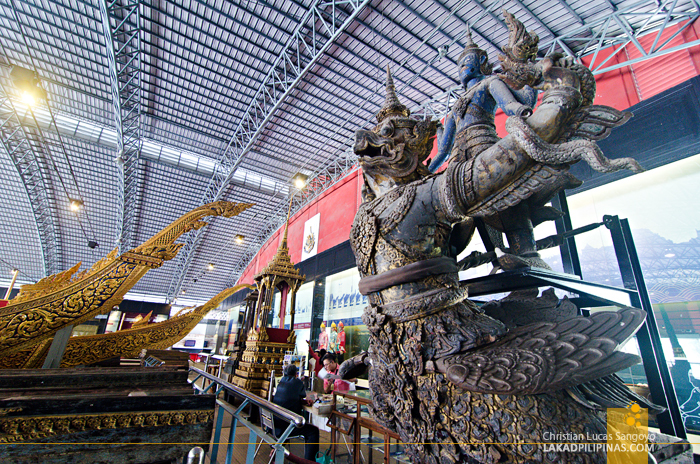 372 kilometers long, it runs from Central Thailand up to the Gulf of Thailand. 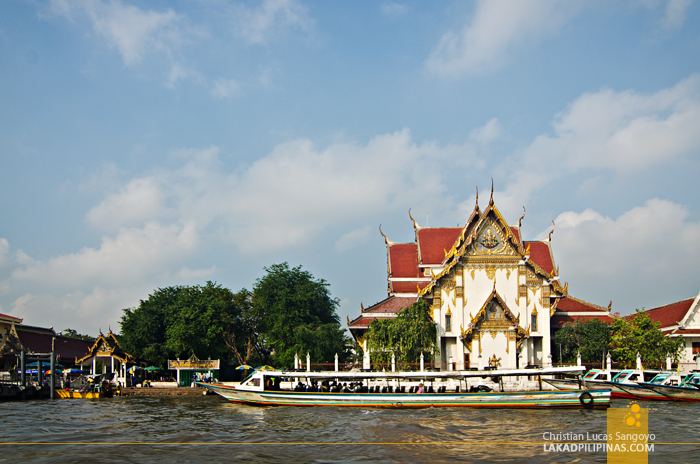 I’ve read about the river being a dividing barrier of cool between the western and eastern side of Bangkok. 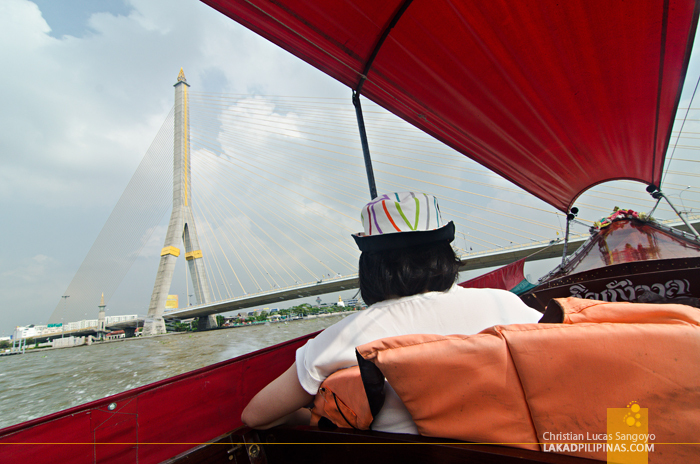 The western side, dubbed Thonburi from the old Kingdom of Siam, has a slower and laid back pace, while the eastern side is where it’s all happening. I’ve seen this river several floors above from our room’s veranda at the Chatrium Hotel Riverside. 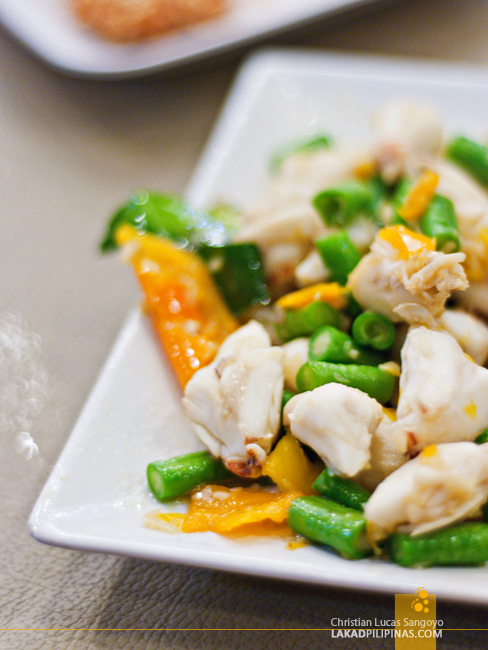 It was my first outing in Bangkok back then, and I was quite impressed. 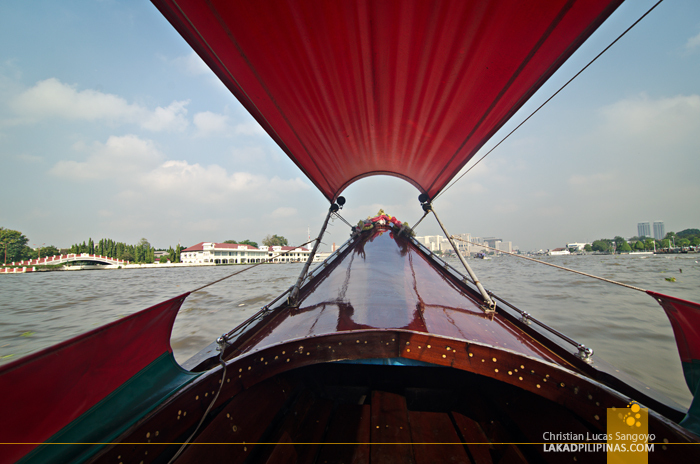 Now I’m about to experience Chao Phraya firsthand, on a long-tail boat, no less. 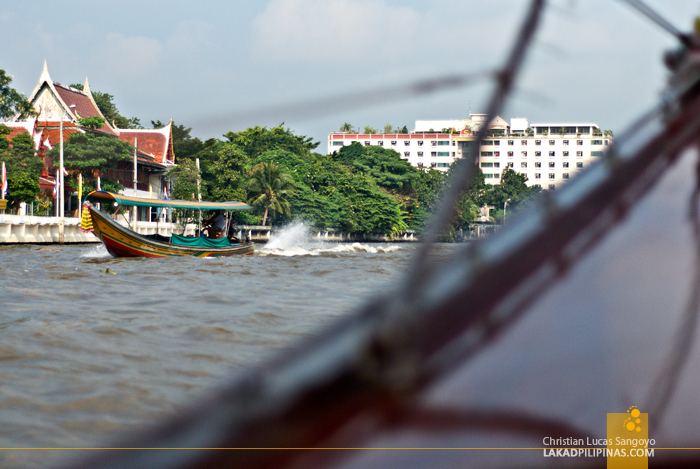 Actually, this is not my first time to have a run across Chao Phraya. I’ve ridden a water taxi from a pier near our hotel to Asiatique The Riverfront before, but it was night time and the water isn’t as choppy. Now, the waters cannot be wilder; it doesn’t feel like I’m on a river but rather, on the roiling high seas. 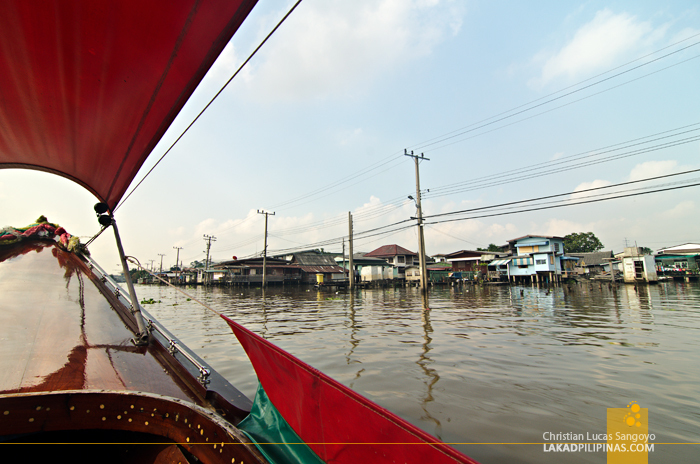 I was struggling for a comfortable position as the boat’s motor roared into life. 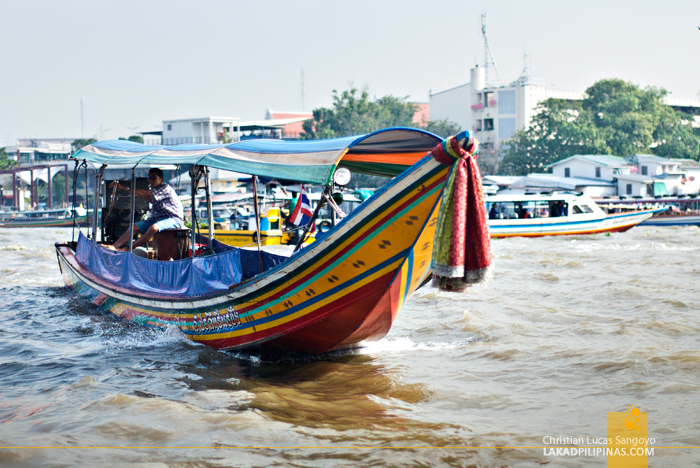 We sprang forward amidst harsh water sprays; right on my face and cameras—which made me ask, how clean are Bangkok’s waterways? I’ve read there are fishes actually living below its mud-colored surface, but that’s really no indication on a river’s health, isn’t it. Even our very own Pasig River has fishes. My headware proved handy for covering my cameras as we dashed in and out of canals, checking out houses right by the water. Most were in good condition but more than a few were in a state of disrepair. And it’s gonna remain that way, our guide told us. Apparently, living right along the canals is already prohibited, except for the existing houses. But once it has fallen derelict, the owner cannot restore it back, he has to move inland. 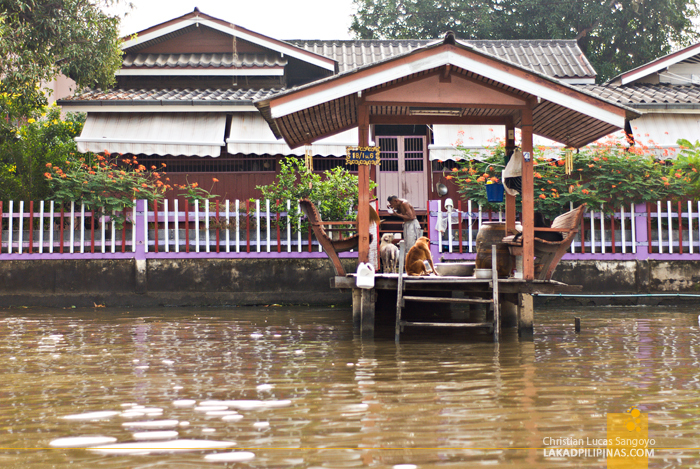 Right before turning back from one of the wider canals, like a superhighway of sorts, which by the way they once were during the old days (which made me wonder, again, why they thought digging canals to be far easier than building roads, I digress), we passed by a Thai temple. Our guide quickly brought out a loaf of bread and started throwing pieces to the water. Apparently, it was fish feeding time. People are not allowed to fish right in front of a temple, she says, so fishes here—catfishes, to be exact—grow into humongous sizes. I didn’t see none of Discovery Channel’s River Monsters, but they were indeed huge, about the size of my calf, which is saying a lot, lol. 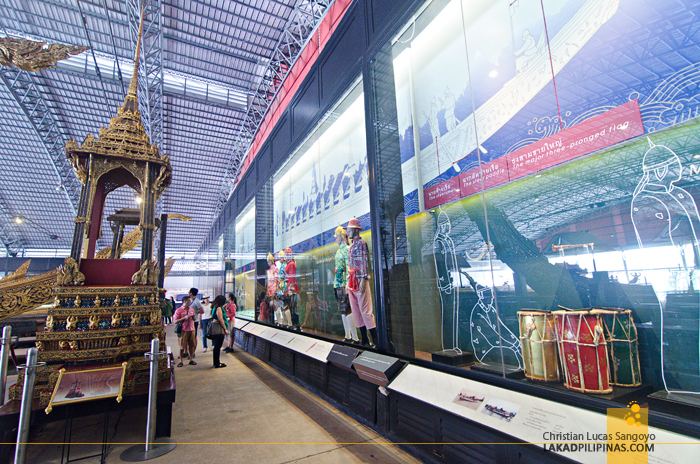 Before heading to dry land, we dropped by a curious museum right by Noi Canal, the Royal Barge Museum. I was trying to hide from our guide, not wanting to experience the discomfort of exiting and entering the boat once more, but alas, I was easily found out. We were only six on the boat. And I guess it was a good thing too, the museum turned out to be quite interesting. 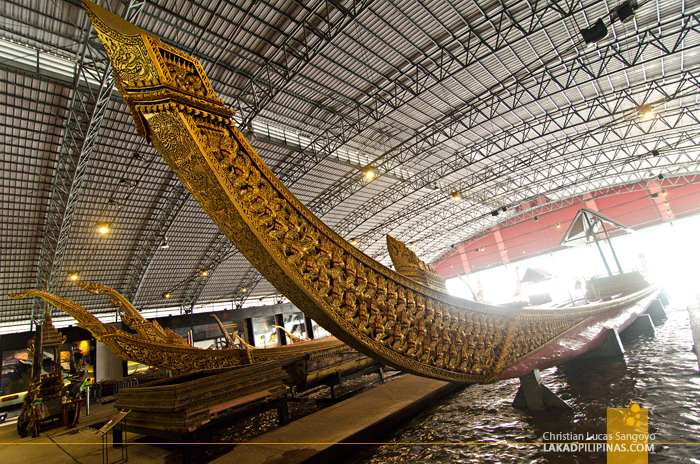 Officially named the National Museum of Royal Barges, it holds a collection of eight royal teak boats used for the Royal Barge Procession, a tradition almost 700 years old wherein more than 50 barges manned by a couple of thousands oarsmen sails down the Chao Phraya River from Wasukri Royal Landing Place to Wat Arun. 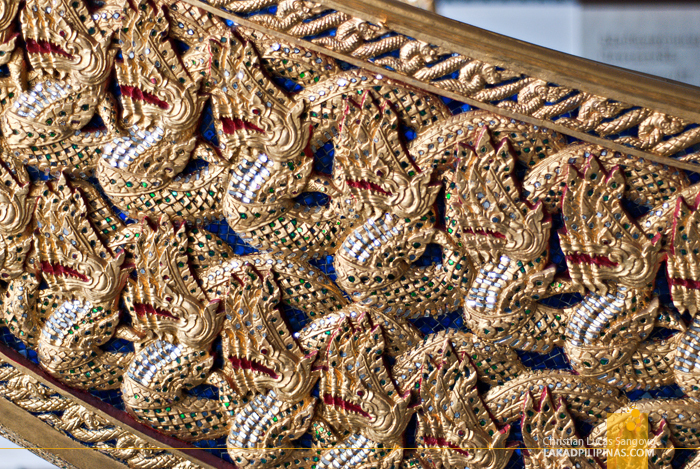 These graceful golden boats sit on dry docks a few feet above the water and indeed, they were a sight to behold; each one intricately different from the next, both in form and detailing. And then, we have to, of course, get back to the boat again and, finally, out again at the Thewet Express Boat Pier. Finally. Finally. Finally. Dry, stable land. 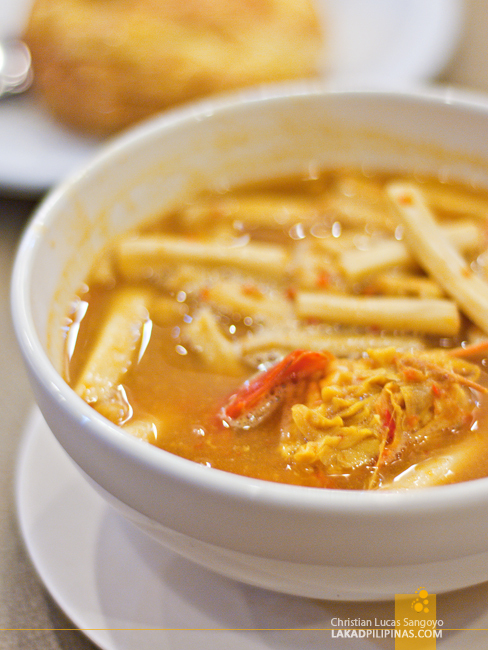 All that splashing around and getting in and out of boats made me hungry, now let’s have some spicy Thai food.